Victorian Wave Crest footed bowl in ormolu mounts. Signed with banner mark of C.F. 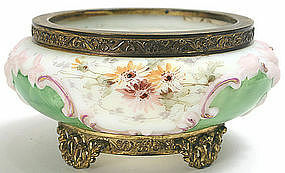 Monroe of Meriden, CT. and decorated in rare colors of green and pink, with hand painted and molded enameled flowers. 19th century. Excellent original condition with no chips or cracks. Size: 5.75 inches in diameter x 2.75 inches high.